When my friend Cindy and I planned a little excursion to Buffalo, the closest U.S. city to Toronto, we had our destination firmly in mind: Walden Galleria. We had heard from friends that it was a great mall with a lot of stores and restaurants we do not yet have in Canada. We started with lunch at the Cheesecake Factory, a really delicious restaurant that is as American as it gets. We wanted to visit the new Anthropologie store that opened there a few months ago, as well as the new Free People store (a division of the Anthropologie brand that skews a bit younger than Anthropologie's demographic) and, of course, Macy's! Since we took the bus and did not have a vehicle with us, we could not overdo it with our spending. Without a trunk to stow our merchandise in, we had to carry it all by hand. This was wise, because, believe me, we were tempted to break the bank! I had a budget of $250, not including meals. I went slightly over, but that's okay. More than half was spent on clothing (I'm a sucker for J. Crew) and the rest was spent at Macy's. Speficially, on Martha at Macy's. I got a couple of the things on my list, which I blogged about a couple of days ago. (See the following post.) You can see my latest Marthaware, below. 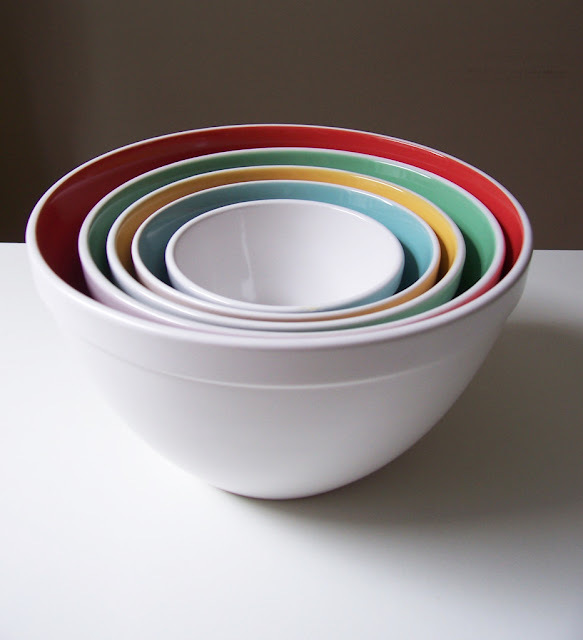 I got this set of five ceramic mixing bowls from the Martha Stewart Collection. I think they are so beautiful and modern. 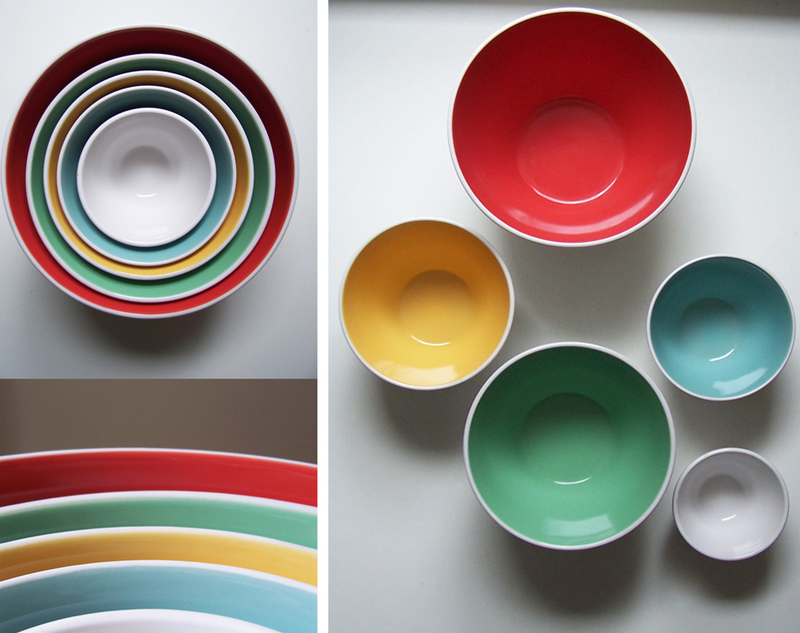 I love the pops of colour and they are very heavy, sturdy and well made. Did Walden Galleria have the 'professional' tools? 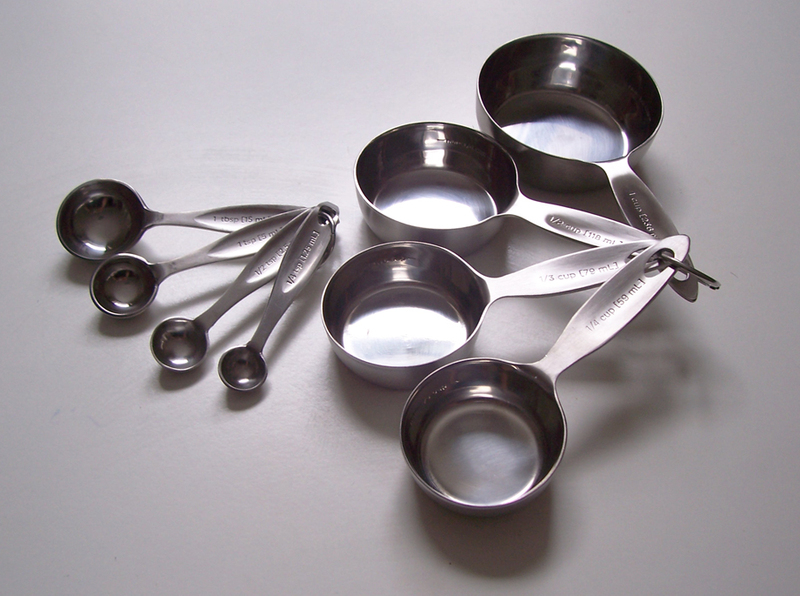 The measuring cups and spoons you got are the older ones that have been in the MS collection... still good. Love the ceramic bowls. No, they didn't have the professional cookware there. I was very pleased with my purchases: useful and beautiful. We have the same measuring cups and they are brilliant! So pleased your trip went well, how lucky to be able to pop into another country so easily. Pru, I always think how nice it would be to fly to Greece in an hour or to hop a train to France! YOU are the lucky one! I hope they bring back more Jadeite coloured pieces to the collection. Thanks for sharing your finds. I have those measuring cups and spoons! I love them, indeed they are heavy and durable and versatile. Andrew, I found your blog through the Beekman boys, really enjoy your take on all things Martha. As one gay boy, who found you through a couple gay guys, to another I wonder how you manage working at and promoting Anthropologie with the anti gay right wing political support of its ownership? I mean this respectfully and am really curious. I used to shop there and at Urban, but can no longer bring myself to give them money then o ome to my husband. You may have answered this under another heading, if so sorry. Btw, I am a native Buffaloian, now living in Minnesota., and love Toronto! Hi Peter and Jim! (Not sure which is writing.) Thank you for visiting the blog and I'm so glad you enjoy it! Richard Hayne is co-founder of the Anthropologie brand and co-CEO of URBN. He is certainly not supportive of gay rights. But on a day-to-day basis, I have to say Anthropologie is one of the most gay-friendly organizations I have ever worked for. I am surrounded by fellow gay men who work for the brand, not to mention fabulous women who love and admire gay men. Many of the executives at Home Office are also gay friendly or gay themselves. I have met many of these people, too. All of them are wonderful people. I haven't ever met a single person who works for this company who is not supportive of gay rights. Richard Hayne is a very, very, very small minority. It's unfortunate that such a tiny fragment of such a great organization that employs hundreds of gay men and women and encourages their creativity keeps people away from the brand. But I respect your wish to do so! Thank you for writing in!